Halloween decorations and crafts are popping up all over. 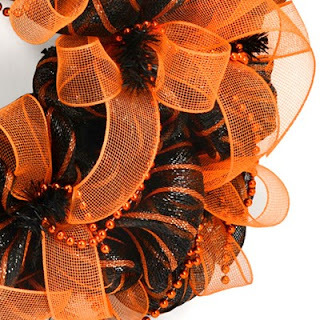 So we were inspired to create this cute Halloween wreath in black and orange deco mesh. The video tutorial (featured below) gives you step by step instructions for making the mesh wreath. Start planning your Halloween decorations now! The simple-to-use wire wreath from enables you to make this custom decorator Halloween wreath in as little as 10 minutes. 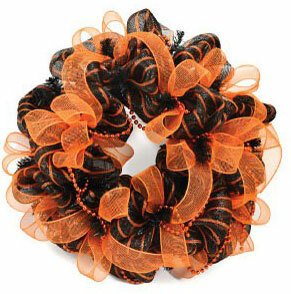 The wreath form has 36 pre-attached wire ties that are used to add deco mesh, ribbon and beads to the form. Add more or less to your wreath for a custom look. 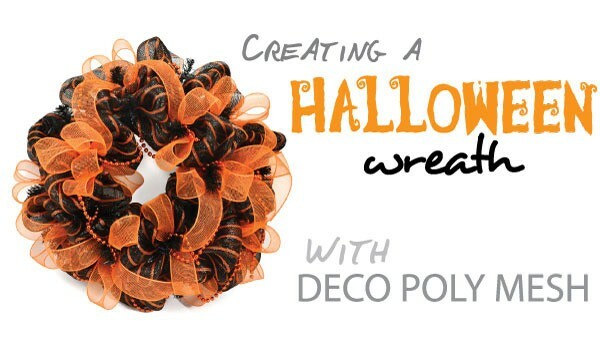 The video tutorial below is a step by step guide for creating your own custom Halloween deco mesh wreath. For our full list of video tutorials on how to make deco mesh wreaths, bows, garland, wall trees and much more, visit Video Tutorials page.